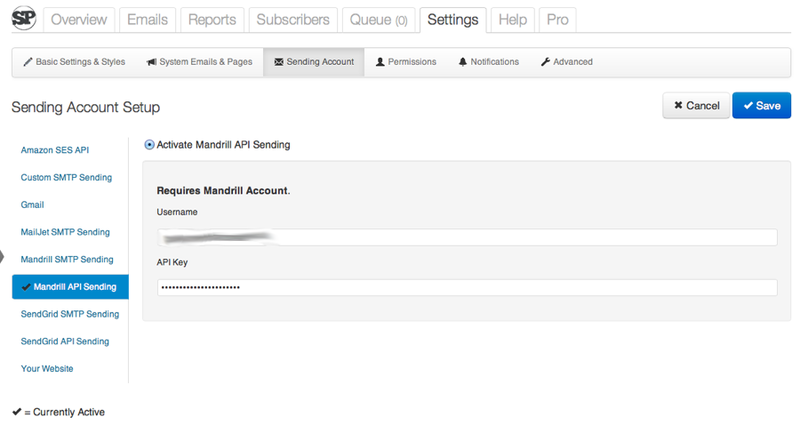 Once you activate Mandrill from the pro tab, there will be new options added under Sending Account, including Mandrill SMTP Sending and Mandrill API Sending (See Below). We strongly recommend the API option over SMTP sending. API sending always send faster than regular SMTP sending. It also ensures that your hosting provider cannot interfere or limit how many messages you can send. Many times, hosting providers will block ports or limit the number of messages that can be sent per day or per hour via SMTP. Best of all, Mandrill offers 12,000 emails per month for free and costs only $.20 per thousand messages thereafter. They give you all the bells and whistles that you would expect from an enterprise sending platform with the added benefit that you can use SendPress Pro from your self hosted WordPress site to send directly through them. SendPress Pro costs $99. Learn more about all the features and try our Free version to see how we can help you send great looking e-mail newsletters from WordPress.